Since the early 1980s, American shoppers have become accustomed to receiving a single-use plastic bag at grocery checkout. The refrain of “paper or plastic?” is a staple of any cashier’s vocabulary. But times are changing, the eco-friendly shopper is asking for retailers to evolve, and the QFC division of the Kroger Family of Companies is honored to lead the way by eliminating single-use plastic shopping bags across its stores. In a typical year, the 62 QFC stores combine to distribute more than 30 million plastic bags. While there are local plastic recycling options, many of these bags take too long to break down and end up in the landfill or in local lakes, rivers and the ocean. For Seattle and Portland-area shoppers who take pride in their surrounding natural beauty, this just isn’t acceptable. “Seeing QFC take this bold step makes me appreciate QFC even more,” says QFC shopper Laura Waltner. When Kroger announced in the summer of 2018 that it would be eliminating plastic bags from its stores by 2025, QFC promised to move even quicker – by the end of 2019. Today, we are happy to say that we beat that goal by eight months. These bags saw their final days in QFC stores on March 31. 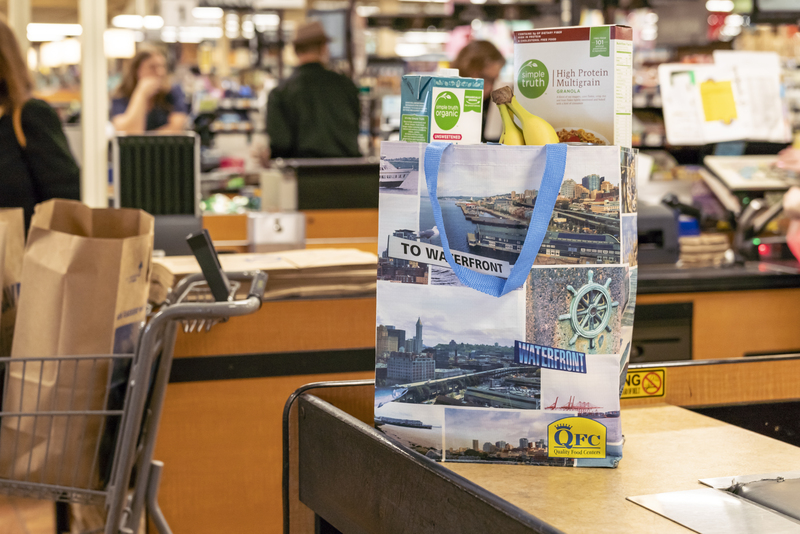 While QFC will continue to offer shoppers paper bags in the event they do not have a reusable bag with them at the store, our goal is to transition customers to the reusable bag model, which eliminates the need for a single use option at checkout. That is why the store associates are inviting their customers along for this Zero Hunger | Zero Waste journey and asking them to shop with reusable bags whenever possible. Throughout the month of April, QFC will be making a $1 donation to The Nature Conservancy for each reusable bag sold in its stores, up to $10,000. “What happens is that this plastic gets broken down into sand-like particles, which gets into the seafood around here. That to me is a concern,” says Phil Levin, Lead Scientist at The Nature Conservancy.